Road Trippers Drug Driving in the UK #Infographic ~ Visualistan '+g+"
The UK has a severe drug driving problem. The laws were updated in 2015, but what has changed in the intervening year? 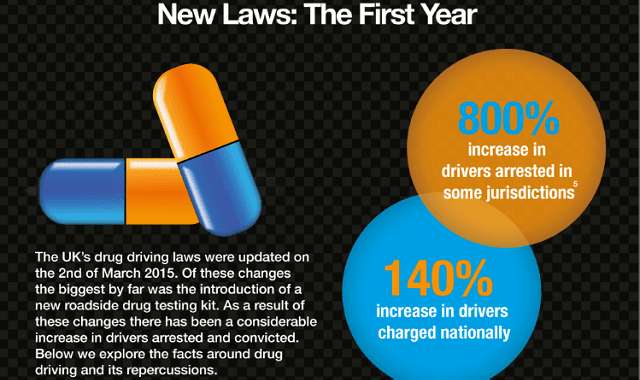 The number of arrests are up and so as are the number of drug driving convictions. And it’s all because of the introduction of a roadside test kit, a small applicator that can identify the drugs in someone’s blood stream. Alongside this kit are new clearly defined limits for a number of illegal and legal drugs. Among the drugs are a number of prescription medications. You will be well within the law provided you stick within your prescription and do not drive if you are impaired; if you are unlucky and end up in court there are grounds for a medical defence. Those who are convicted of driving under the influence of drugs will face a fine up to £5,000, a 12-month driving ban and even 12 months in prison.